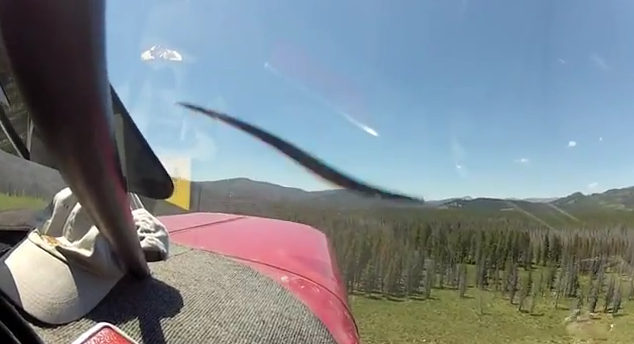 This past June, four men were flying in the mountains of Idaho and brought their GoPro cameras to capture the experience. Unexpectedly, the airplane ran into some trouble during the flight and crashed. Here’s their incredible video footage of that crash, which is shot from inside the cockpit (from two different views). Everyone (thankfully) survived, and the pilot, who sustained the most injuries, will make a full recovery. Los Angeles Times has more of the story. …Miraculously, everyone survived. The pilot will make a full recovery and the rest of us escaped with superficial injuries and feel very lucky to be alive . This trip was much anticipated and due to our excitement we had our Gopro cameras filming at various times. After flying up into the mountains for a morning hike in the Frank Church River of No Return Wilderness we were planning on flying to a small mountain town for dinner. Due to warming temperatures there was an increase in density altitude and we had a hard time getting adequate lift. After taking off we hit an air pocket that made us rapidly loose altitude, pushing us down into the trees. The cameras were left on for a couple of hours during the aftermath.